Jim Ottaviani has written nonfiction, science-oriented comics since 1997, notably the number one "New York Times" bestseller, "Feynman "and "Fallout" which was nominated for an Ignatz Award. He has worked as a nuclear engineer, caddy, programmer, and reference librarian. "Primates "is his first collaboration with artist Maris Wicks. He lives in Ann Arbor, Michigan. Maris Wicks ("Primates")""lives with fellow primate Joe Quinones and their cat, Biggs, in Somerville, Massachusetts. She has used her opposable thumbs to draw comics for Adhouse Books, Tugboat Press, and Spongebob Comics, and written stories for Image and DC Comics. When she's not making comics, Maris works as a program educator at the New England Aquarium. She is an avid tool user and is particularly fond of bananas. 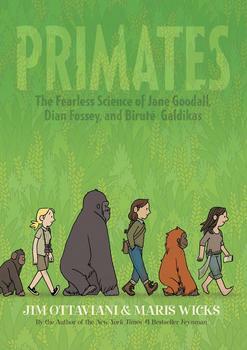 A fun and immersive look into the lives of the three greatest primatologists of the twentieth century: Biruté Galdikas, Dian Fossey, and Jane Goodall.